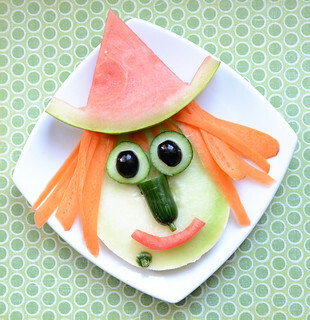 Arrange fresh fruits and veggies as a silly Halloween witch for a nutrient-packed snack kids love. 1. Place your slice of honeydew melon on a plate. 2. Take your carrot, and using your knife (or a veggie peeler if you have one), cut long, thin slices off your carrot. You’re going to need about 10 slices. Place these slices all around the top of the slice of melon for the witch’s hair. 3. Grab your watermelon slice, and using your knife, cut the watermelon into a hat shape. Place this hat on top of the witch’s head. 4. Using your knife, cut the end 2 inches off of a cucumber. Then cut this piece in half and place it on the melon for the witch’s nose. It’s even better if this cucumber slice has a warty thing on the end. 5. Using your cucumber again, cut 2 slices off the cucumber. Place these cucumber slices on the witch for the eyes. 6. Grab your black olive and slice it in half. Place each half on the cucumber slices to finish off the eyes. 7. Take your slice of tomato and cut it into a smile shape. Place this on your witch. 8. And finally, if your cucumber has another warty-looking thing on the other end, slice it off and put it on the witch’s face for a wart. This witchy snack was perfect for my kids to share and they loved every single bite. Enjoy! This witch is the cutest thing ever. You really had your thinking “hat” on for this one!